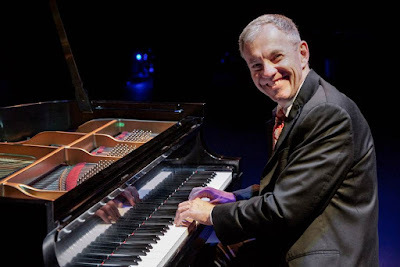 "Anton Nel, winner of the first prize in the 1987 Naumburg International Piano Competition at Carnegie Hall enjoys a remarkable and multifaceted career that has taken him to North and South America, Europe, Asia, and South Africa." Some years ago I came across a 1993 live recording of Saint-Saëns Piano Concerto No. 5, featuring Sviatoslav Richter. I didn’t know the piece, but I figured that if a great artist like Richter thought it was worth his time to learn it, it was probably worth my time to listen to it. And what a revelation it was. At the time, I was no great fan of Saint-Saëns but hearing this concerto forced me to re-examine my prejudice. Nearly every Saint-Saëns piece, apart from The Swan, has thousands of notes and Piano Concerto No. 5 is no different in that respect. It also has some good tunes - another Saint-Saens trademark - as well as fresh and original passages of music, especially in the second movement, and pianistic challenges that have to be heard to be believed. What I heard this past weekend in Austin not only confirmed my affection for the concerto, but also showcased the artistry of internationally renowned pianist Anton Nel, who deservedly brought the capacity audience to its feet with his spectacular rendition of Saint-Saëns Piano Concerto No. 5. Anton Nel, a local favourite in Austin, heads the piano department at the Butler School of Music at the University of Texas and appears with the Austin Symphony nearly every season. A consummate artist, Nel’s vast repertoire embraces nearly everything written for the piano, and his technique beggars the imagination. He has that rare ability to lift music off the page and into the hearts and minds of his listeners. A communicator of the highest order, he imbued the peculiar modal melodies of the slow movement of Concerto No. 5 with a poetic inner life and in the last movement, his ferocious rendering of the repeated passages in the bass was electrifying. This was great playing by any standard and must have won new friends for this rarely-played Saint-Saëns concerto. And what an inspired choice of encore - a perfectly charming rendition of Chabrier’s Scherzo-Valse. Wonderful! Thoughtful and satisfying in nearly all respects, the evening’s program featured attractive recent works by two Austin composers. Donald Grantham teaches composition at the Butler School of Music and over the years he has produced a significant body of work. J’ai été au bal is a real crowd-pleaser and deserves more frequent performances. In the words of the composer, it “is a celebration of some of the popular/folk music styles of Louisiana – in particular, Cajun music and the brass band tradition of New Orleans.” It is very much in the tradition of Aaron Copland, whose ballet score Rodeo was heard later in the concert. Both Grantham and Copland took real bits of American popular and folk music and each used them as raw material for his own evocation of Americana. In neither piece are tunes merely quoted verbatim one after the other; rather, they are transformed rhythmically and melodically and given surprising orchestral timbres to become something new and interesting. Grantham not only used authentic Louisiana songs, but also added some of the instruments typical of his sources, such as washboard and spoons. Under conductor Peter Bay the Austin Symphony played Grantham’s celebration of “all things Louisiana” with skill and enthusiasm. Steven Serpa’s An Invocation for oboe and string orchestra was a far less ambitious piece and much less compelling. The orchestra’s principal oboist Beth Sanders played very well but the work was little more than a pretty pastoral interlude. Copland’s Rodeo (1942) - by now one of the classics of American music - along with his other “cowboy” ballet Billy the Kid, established the style for music depicting the American West. Composers writing scores for western films owe a great debt to Copland. Listening to the music last weekend, I was struck by how enduring it is, and how deeply it expresses an important part of what it means to be an American. This dimension, which was widely understood at the time of the premiere in 1942, seems even more meaningful today. At a time when many Americans are uncertain about their future and divided about their identities, the spirit of America lives on in music like Rodeo. Nearly every professional orchestra in America can play scores like Rodeo as ‘to the manner born,’ but Peter Bay and his musicians gave us something more. Accurate and sparkling, the performance was also extraordinarily sensitive to the unusual timbres and to the remarkable beauty of the score’s quiet moments. Finally, in this “complete” performance of the ballet score we also had the honky-tonk piano - a wonderful touch! Over the course of his career, Paul Evans Robinson has acquired a formidable reputation as broadcaster, author, conductor, and teacher. He has communicated the joy of music to more than a generation of musicians and music lovers in Canada and elsewhere. Paul’s reviews and articles can be found on Classical Voice North America, La Scena Musicale, and Musical Toronto. This live concert review appeared first on La Scena Musicale.